Hypercalcemia (Hypercalcemia) is a condition that indicates an elevated calcium (Ca2+) level in the blood. It may be presented as acute, chronic, or transitional dysfunction. With mild hypercalcemia below 12mg/dL, many individuals stay virtually asymptomatic, although the symptoms thought to be always present in mild form, such as elevated thirst, anxiety, sleep problems and fatigue. Hypercalcemia can occur due to abnormally high skeletal calcium release mediated by parathyroid hormone release, increased intestinal calcium absorption, or decreased renal efficiency of calcium excretion. The neuromuscular side effects of hypercalcemia are caused by a negative bathmotropic effect resulting from increased interaction of calcium with sodium channels. This raises the threshold for depolarization because calcium blocks sodium channels and inhibits depolarization of muscle and nerve fibers. This appears contributes to chronic painful syndromes development such as Myofascial pain syndrome and fibromyalgia. Hypercalcemia increases urinary excretion of ionized calcium (iCa), ionized magnesium (iMg), sodium, phosphate, potassium, and chloride. Parathyroid hormone increases osteoclast activity and the osteoclasts break down bone, which increases blood levels of calcium. Familial hypocalciuric hypercalcemia is a condition where a serum calcium level typically above 10.2 mg/dL. Mostly associated with loss of function mutations in the CASR gene, which encodes a calcium-sensing receptor, expressed in parathyroid and kidney tissue. 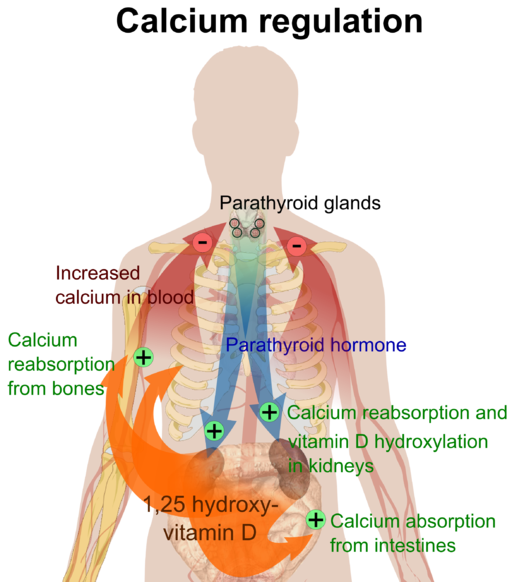 The perceived lack of calcium levels by the parathyroid leads to high levels of parathyroid hormone, resulting in hypercalcemia. Hypervitaminosis with A [srs] or D [srs] vitamins. Continuous supplementation with vitamin A is associated with with osteoporosis and hip fractures apparently due to vitamin a impairing the expression of proteins dependent on vitamin K to reduce the efficacy of vitamin D. Studies have linked high vitamin A doses with increased bone resorption and decreased bone formation. Vitamins A and D may also compete for the receptors that affects parathyroid hormone production that affects the levels of calcium in serum. The typical representation of hypercalcemia is generally raised PTH levels, hypophosphataemia and an increase in 24-hour urinary calcium excretion, increased serum creatinine levels. Parathyroid hormone (PTH) values should be interpreted together with serum calcium and phosphorus levels, and the clinical presentation and history of an individual. Calcium and magnesium can be measured by a mineral hair analysis test. Note that calcium levels may appear lower on the mineral hair test if magnesium levels are low, as deficiency in magnesium may reduce excretion of calcium. Magnesium blood levels can be measured via blood serum testing, however, the redulst can be misleading since only about 1% of magnesium is found in blood, and about 0.3% is found in blood serum, therefore clinical blood serum testing may not successfully identify magnesium deficiency. Calcium blood levels may reflect a minimal relationship between symptoms of hypercalcemia and the actual level of calcium. Calcium in serum is bound to proteins, principally albumin. As a result, total serum calcium concentrations in patients with high or low serum albumin levels may not accurately represent the physiologically important ionized or free calcium concentration. In patients with hypoalbuminemia for example, total serum calcium concentration may be normal when serum ionized calcium is elevated. A low PTH and high phosphorus levels in hypercalcemia suggests that hypercalcemia is not caused by a transitional increase in levels of parathyroid hormone or PTH-like substances. An low PTH level with a low phosphorus level in hypercalcemia suggests the diagnosis of paraneoplastic hypercalcemia caused by parathyroid related peptide (PTHRP). PTHRP shares N-terminal homology with PTH and can transactivate the PTH receptor. This can be produced by different tumor types. Parathyroid hormone-related protein (PTHrP) must be evaluated if cancer is suspected. When a tumor secretes PTHrP, this can lead to hypercalcemia. About 90% of the individuals with primary hyperparathyroidism have elevated PTH levels. The rest, have normal (inappropriate for the elevated calcium level) PTH levels. About 40% of individuals with primary hyperparathyroidism have serum phosphorus levels <2.5 mg/dL and about 80% have serum phosphorus <3.0 mg/dL. The goal is to first reduce the blood concentration of calcium and treat the underlying cause immediately after. Strength training, weight bearing – lifting weights and performing muscle development exercises can reduce calcium levels in the blood by strengthening the bones. Increase dietary salt intake (use sea salt only). Increased sodium intake will help to increase the body fluid retention, while increasing urinary sodium excretion along with calcium excretion as sodium and calcium are handled similarly by kidneys. Magnesium 400-800 mg, daily, in divided doses or magnesium oil. Note, when deficient, magnesium oil may cause itching. Supplementing with magnesium orally for a few days prior to using magnesium oil, may help reduce itching. It may take up to 12 months to normalize magnesium levels when supplementing orally. Transdermal magnesium oil may restore magnesium levels within a few weeks. Potassium excretion is elevated when calcium levels are high. A banana per day can be sufficient to keep the potassium levels in check. Over supplementing on potassium can also cause magnesium deficiency. Vitamin K2 200-1000 mcg in divided doses daily. Deficiency is implicated in deposition of calcium on artery walls and other tissues. Vitamin K2 is required to carboxylate vitamin K-dependent Gla-proteins, including essential for bone health osteocalcin and matrix-Gla protein that prevents calcification of soft tissues. Vitamins A, D and magnesium should also be taken as a complex with K2. Probiotics of wide spectrum may be necessary if intestinal flora is not balanced, which will further hinder the absorption of B group vitamins and vitamin K2. Strontium Citrate (if deficient only) boosts osteoblast production and bone synthesis and helps to maintain a more alkaline pH whereas an acidic pH causes activation of osteoclasts that break down the bone, releasing more calcium into the blood. Strontium may slightly lower PTH and calcium levels. Vitamins A, D supplementation without co-factors of Vitamin K, boron and magnesium [srs]. Vitamin D uses vitamin K-dependent proteins, therefore in case of vitamin K deficiency, the malformed proteins may be formed causing vitamin D toxicity and ultimately hypercalcemia. Nightshade vegetables as they are rich in calcitriol which raises blood calcium. Naturally ripen nightshade vegetables are better than commercially gas ripen. Cinacalcet (Sensipar), has been shown to lower calcium levels in the blood by reducing production of parathyroid hormone, may be effective for some people with hyperparathyroidism. Alendronate (Fosamax), risedronate (Actonel) or ibandronate (Boniva) — in case of osteoporosis may preserve bone mass in spine and hip, reducing risk of fractures. In case of hyperparathyroidism, abnormal parathyroid gland(s) are advised to be removed for long term benefits.